Well, it’s been far too long since I last posted, yet again. Sorry for that, folks! It’s been a pretty crazy summer, with the biggest news being that we moved into a new apartment in a new neighborhood at the end of June. We lived in the same apartment in Park Slope for four years and our landlord chose not to renew our lease, so we spent the end of May and beginning of June frantically looking for a new place. 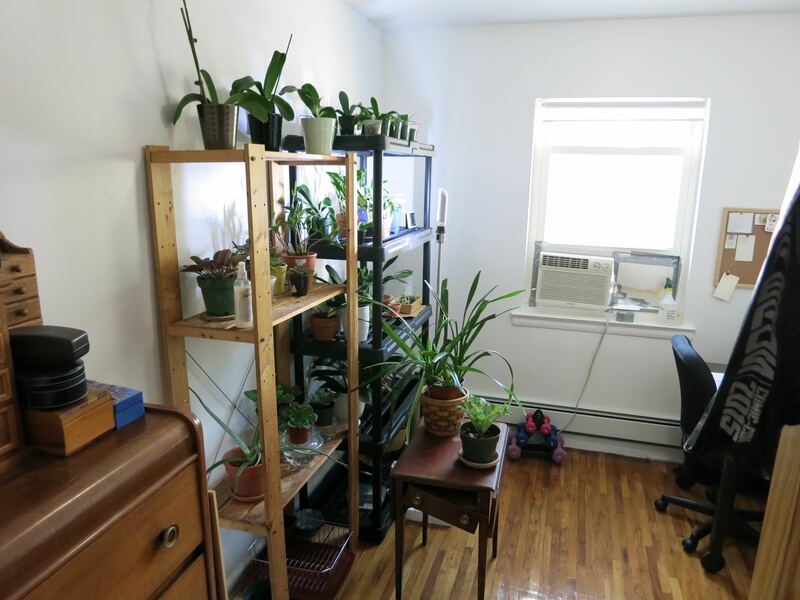 Once we signed a lease on an apartment in Windsor Terrace we had to actually go through with the moving part, which was NOT FUN AT ALL…but we survived. As upset as we were about having to move apartments, we adore our new place and neighborhood—it’s so quiet and lovely! So that’s how my orchids ended up with a new growing location, which doubles as the orchid room and my office. I wanted to share my new orchid setup here, along with some photos of what’s been going on with some of my orchids since the move. I’m sitting at that desk as I write this post. Meta! You probably noticed the awkwardly-placed lamp with a funny-looking bulb right in front of the black shelves; that’s an LED Vivarium-Grow Lamp that I purchased for $22 from FirstRays.com. My new orchid room has southwestern exposure, whereas my previous orchid room had southern exposure. Our last apartment was also one floor higher and had larger windows, so I was worried that this new room might not offer my orchids enough light. I did a touch of research on orchids’ light intensity needs and I downloaded a light meter app on my iPhone to try to gauge the room’s light intensity, but the readings were so incredibly low (like 4 to 7 lux) that they didn’t feel accurate. Still, I decided to purchase the bulb and stuck it in an Ikea lamp stand to give my higher-light orchids some extra rays. I’ve had the bulb in place for at least a month now and the orchids on that shelf seem happy, so I’m just going to leave it there for awhile and see it how goes. Very scientific of me. Wow! That tall growth you see in the photo on the left actually broke off a couple weeks ago while I was watering. I didn’t see it come off, but I found it lying sadly on the kitchen counter, and I was horrified. At least the plant has canes to spare! Also, I’m in the midst of combatting what I think is a fungus gnat invasion. I got some yellow sticky stake insect traps, Mosquito Bits, and Orange Guard (all purchased from Amazon) for a multi-pronged attack. The yellow sticky strips are definitely catching a lot of these lil’ buggers in my Cymbidium pot…yuck. What I also need to do is repot the Cym with fresh mix, and probably some of my other orchids too. The pests aren’t on all of my orchids, so that’s good—I’m hoping to be able to eradicate them before they spread. None of my African violets have bloomed since we moved, which is a little troubling because at the old apartment I pretty much had at least one in bloom at all times. I may need to move them around a bit and give them some more light. Unfortunately, I do have a sad note. None of my Costa Rican flask orchids have made it. The Brassias were the first to go, and the Epidendrum seemed to be doing well until a couple weeks ago when it wilted, then turned brown and shriveled up. I wonder if they should have spent some more time in their flasks before being removed and potted? At least I had the opportunity to give them a shot. So that’s what’s been going on around here. Fall is just around the corner, which means we’ll be getting into Phal spiking season soon. 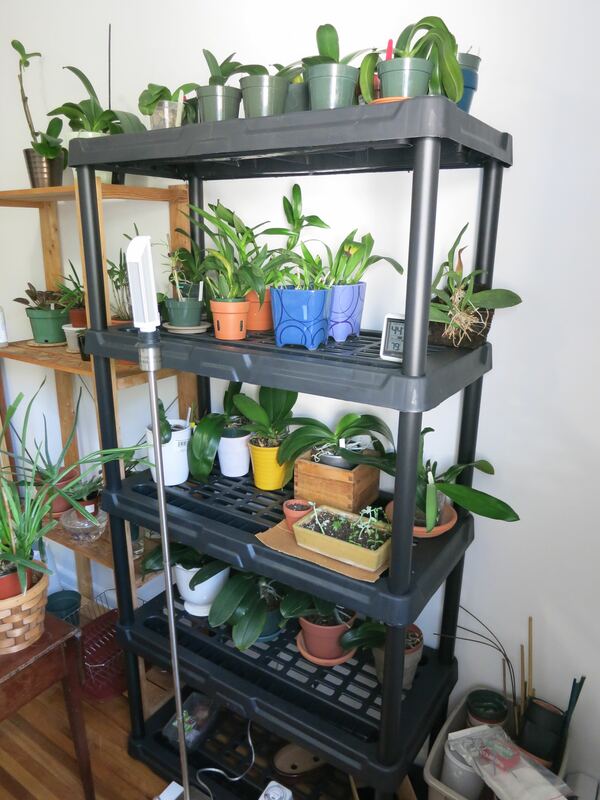 Let’s hope I get some spikes this year—my orchids have been rather lazy as of late! P.S. If you’re at all interested in the non-orchid related parts of my life, you can check out my personal blog here. This post contains affiliate links. Please note that I did NOT receive any of the above products for free in exchange for promotion from any of the brands listed.